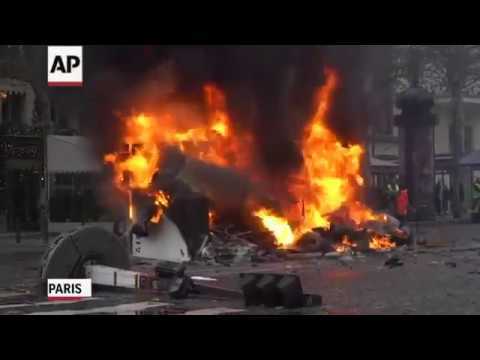 PARIS (AP) — French police fired tear gas and water cannons to disperse violent demonstrators in Paris on Saturday, as thousands gathered in the capital and beyond and staged road blockades to vent anger against rising fuel taxes. The famed avenue was speckled with plumes of smoke and neon — owing to the color of the vests the self-styled “yellow jacket” protesters don. French drivers are required to keep neon security vests in their vehicles. Macron has so far held strong and insisted the fuel tax rises are a necessary pain to reduce France’s dependence on fossil fuels and fund renewable energy investments — a cornerstone of his reforms of the nation. He will defend fresh plans to make the “energy transition” easier next week. Chris Den Hond and Patrick Hermensen contributed to this report.